I owe David Chang a huge thank you. 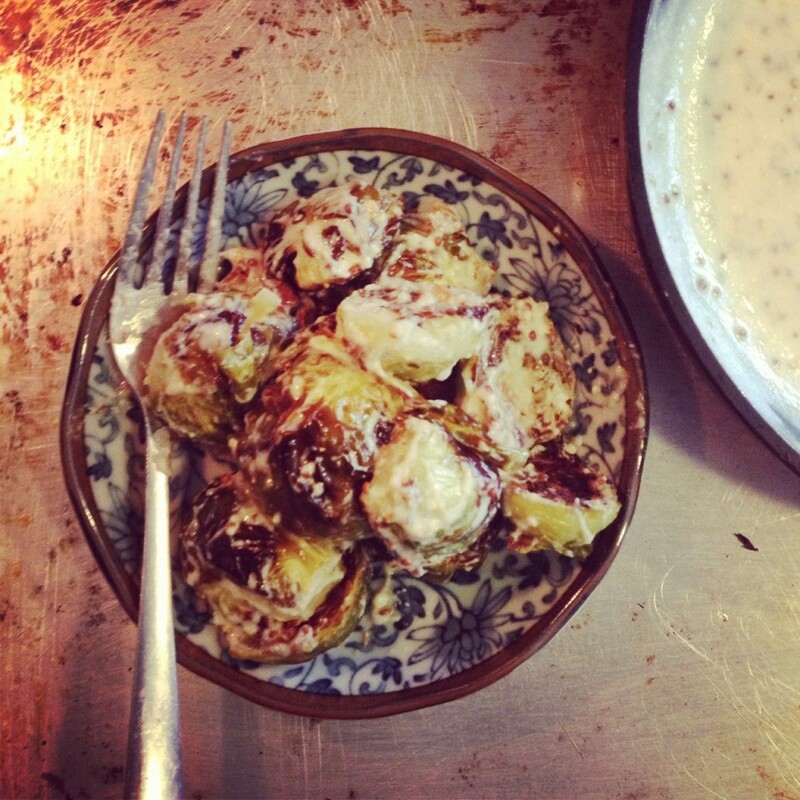 A trip to his restaurant in 2007 started my love affair with Brussels sprouts. At Momofuku Saam, sprout halves roasted to within an inch of their life, crunched between my teeth like popcorn. Bathed in fish sauce and topped with spiced puffed rice cereal, I couldn’t get enough. Lucky for me, Gourmet published the recipe in October that year, and I’ve never looked back. Until last month. At Jamison restaurant in the Pearl, I met a new Brussels sprout dish that captured my tastebuds. While dining with my boss and a few community partners, a plate of lightly roasted Brussles, quartered and dressed in a mustard cream sauce topped with Parmesan made its way around the table. I should have been networking, talking about common interests, opportunity for partnership. Instead, as my dining companions chatted, I mentally broke down how I would make this dish at home. I’d use a similar roasting process to the Momofuku sprouts, replace the cream with cashew cream, use an Oregon mustard, and finish the dish with toasted Oregon hazelnuts. After a couple tests with the cashew cream sauce- don’t let it get too hot, don’t make it too thick, and don’t use too much salt, I ended on a dish that will be appearing on this year’s Thanksgiving table, and many more winter nights to come. 1. Heat your oven to 450 degrees with the oven rack positioned in the middle. 2. Toss the Brussels sprout halves with the canola oil in a large bowl. Place on a baking sheet cut side down. Roast in the oven, on the middle rack for 25-30 minutes, rotating pan once halfway through. 3. While the sprouts roast, drain the cashews. Place in a blender with 1 cup water and blend on high for 30-60 seconds until smooth and creamy. Transfer the sauce to a small sauce pan. Heat over medium for just a few minutes to warm the cream. Be careful that you don’t let the cream get too hot or keep it on the stove for too long as the cream will thicken- if this happens, add water by the tablespoon until you get the desired thickness. Off the heat, add the mustard and salt and taste for seasoning. Transfer the sauce to a large bowl. 4. Remove the sprouts from the oven. Turn one over, it should be golden brown and crisp on the bottom. Transfer them to the bowl with the mustard cream. Add in the hazelnuts and toss to combine. Taste again for seasoning. Depending on the strength of your mustard, you might want to add some lemon juice or a little black pepper.